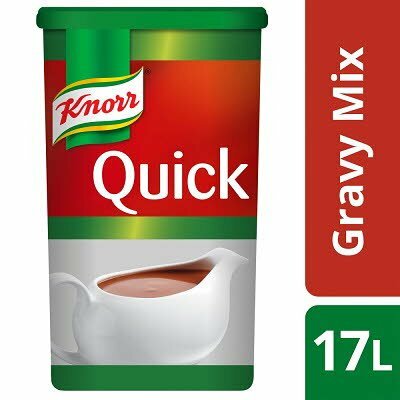 A dry mix to prepare gravy for all occasions. Potato starch, WHEAT flour, salt, palm fat, yeast extract, vegetables (toasted onion powder, tomato puree powder) maltodextrin, flavour enhancer (monosodium glutamate ), caramel syrup, modified corn starch, sugar, fructose, SOY sauce (SOYBEANS, WHEAT), bay leaf powder, cloves, flavourings. May contain milk and egg. Dissolve 73g of powder into 1 litre of boiled water, stirring constantly. Bring back to the boil and simmer for 1 minute,stirring constantly.